Unlike an American Tail these films are generally more friendly towards each other. It seems everyone likes the first one (by differing levels), but the second one is a base breaker. George Miller, the writer and director of the Mad Max films, was the main writer of both films. He directed two, but Chris Noonan directed one. This gives a similar idea and moral, but a very different style. One attempts to make every second enjoyable, while two relies on a few great scenes and the others build it, but feel like an afterthought. I have more nostalgia for two. I went through a pig phase at a young age. I constantly saw trailers for one, and then bought the second one thinking there was only one. The film still made sense without context. 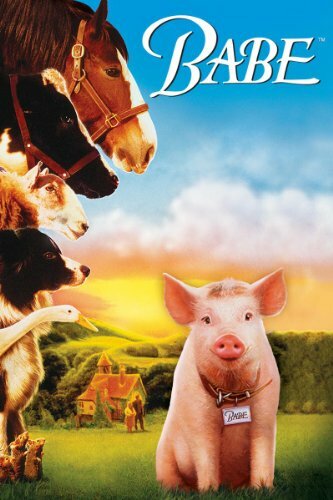 I also saw the first one at a young age a few times, but most of m nostalgia is from the second one, which my pig phase made me watch constantly. Like all Universal films at this era they have great trailers, but the second one especially has a really awesome Universal Theme Pzrk trailer with Spider-Man fighting Doctor Octopus, and that was my introduction to Spider-Man. Most people say the second film is incredibly dark and one is very light. I actually think one is far darker. How does one open? With the narrator talking about how pigs leave to pig paradise, “A place so wonderful that no pig had ever thought to come back.” It says that in a dark room, while the pigs are shown being packed in a meat truck. 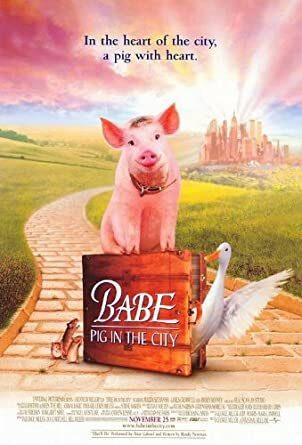 To make it more dark it does a very good job at making Babe sympathetic right away and portraying everyone else as content to wait their turn for death. Two’s opening plot is the boss getting injured, but the writing makes it sound more like a poorly written comedy than a terrible accident but the writing in the next scene makes up for it. Some well known dark scenes from two include a dog nearly drowning and that leads to the film’s best or second best scene, but an animal in danger was nothing new to me as a five year old who often watched The Land Before Time. The clown having a heart attack and dying is dark, but I always assumed he was just having pains and needed to be in the hospital. That is actually a major strength from two. It shows how children could look past the darkness but still get the feeling of dread, but adults could see what is really going on and realize how bad things are getting for the main characters. The scene with the animals talking about being abandoned is very dark and it is handled well with a serious mood and then some needed comic relief from Ferdinand and Flea Lick. Another major part of one’s darkness is Duchess. She sure has changed. She is a wonderful villain. She makes the main character try to die and she never tells a lie, a half lie, or leaves anything out. She just tells how hard the world is and how unfavorable it is to pigs. Her last shot is her being very happy. She then gets refuted later. She also has very little screen time to keep the focus on the heroes. She is an incredible villain and makes one of the darkest scenes I have ever seen. Normally the characters like this are reduced to only telling a half truth, but she tells everything. As a result the main characters are speechless to respond. Despite two going for the big scenes its best scenes are inferior to one’s best scenes, which include the best song I have ever heard in a film, “If I had Words.” IT is funny and tear jerking. The farmer cannot respond with reason as he did get Babe to eat him for the reason, but he also right away saw something in him, and to regain his trust Hogget must communicate that. In one Esme plays second fiddle to Arthur, while in two that is reversed. They are very different, and that is good. It helps show that two is not a copy and paste of one. Their different personalities are used well, but Arthur is better, as he has a very clear major characteristic that fits the films’ moral. He sees the value where no one else does. He made a gate out of trash early. Then he realizes there is more to Babe than a dinner. That is how he finally gets the sheepdog grand champion. The side characters are very good in both films. Flea Lick is awesome. Thelonius is great. The others have such great potential, but the film is a half hour too short to take advantage of them. In one Rex and Fly are the dominant supporting characters and they are very well developed. Ferdinand is an important side character in both films. In two he is good comic relief. In one he is a major part of the moral about changing the bad parts of life. Two does have better end credits. Randy Newman’s song is great at the end. The mice singing “If I had Words” is still very good, but not as good. Two is better for kids, but one is superior to adults. Two is hard to follow the plot but easy to follow the characters. Making them get fascinated bu it. One is the most emotional film I have ever seen. It is a terrific movie, while two is merel very good and had a tough act to follow.